Medical services are very expensive in these areas. Hospitals and health centers are often too far from these towns that almost fade into obscurity and most times, people suffer alone, said John Bermudo,PCPPI's Head of Human Resources for Visayas and Mindanao. This initiative is our way of bridging the gap by bringing the medical services closer to them. With the purpose of providing healthcare to the underserved communities of Batad Iloilo, post-graduate interns of the Department of Health Philippine Centers for Specialized Health Care internship program partnered with Pepsi-Cola Products Philippines Inc. (PCPPI) to host a two-day medical mission in the municipality. The project, G sa Iloilo: Reach the Unreachable, was run by the 16-member, Team G of the DOH special internship program. Along with volunteers from the municipal health office and PCPPI employees, they reached hundreds of locals in the small and medically underserved communities of Bulak Norte, Binon-an, and Cabagohan with comprehensive, holistic medical service.The internship program has a long history of providing free medical assistance to depressed areas all over the country, said team leader Melissa Caparros. 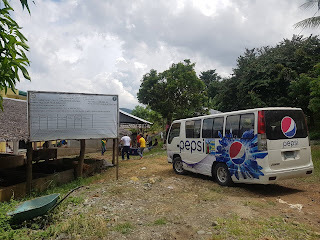 Free consultation and medication were given to the locals who also enjoyed complimentary Pepsi products like Aquafina and Premier mineral water, Tropicana juice, and Gatorade. Batad is a far-flung, rural municipality in Iloilo consisting of 24 barangays whose communities thrive off of agriculture, fishery, and manual labor. With the average daily income ranging from 200 to 300 pesos a day for a family of four to five members, locals often delay consultations and decide against seeking medical assistance from the far and expensive hospitals in the city.Though each barangay has a health center, services are usually for basic medical cases,said Batad municipal health officer, Dr. Maria dela Rosa. Being the only doctor serving all the barangays in the municipality, Dr. Dela Rosa said it can be difficult for the locals to be able to schedule check-ups or get medicine for their ailments and immediate medical needs. They are also too scared to visit the doctors in the city because they feel they won't have enough when the prescriptions for their medicines come, said Roy Alleno, Barangay Chairman of Bulak Norte. Teodora dela Cruz, Barangay Chairman of Cabagohan agreed, Medical missions are quite rare here, this is only the fifth one in the six years I am incumbent. The residents truly appreciate it because they don't have to travel far nor pay for the medicine and the services they need. With the success of the project, Team G expressed their thanks to their partners in helping them reach out to the community. We're very thankful for the municipal office of Batad as well as for PCPPI and its volunteer employees, said Caparros. It was very difficult for us to find big companies who were willing to sponsor this project perhaps because the area is too far. We're grateful that Pepsi Philippines believed in what we wanted to achieve. Partnering with them was beneficial to our goal because of their already strong presence in the community. PCPPI is optimistic in planning to replicate the initiative across the region.Recently, our initiatives with the government focused on environmental projects like estero clean-ups in partnership with the Department of Environment and Natural resources to prepare for the rainy season, or road side tree- planting with the Department of Public Works and Highways said Bermudo. With today's turnout we will add and continue this program in our own list of initiatives. We are continually planning more outreaches and programs targeted to help better serve the communities who have given us their full support through the years and those that helped build us into the company we are today, like Iloilo.